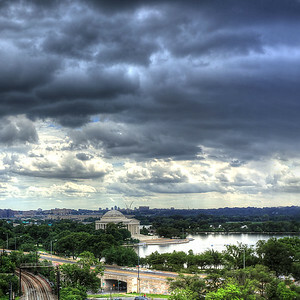 I grew up in the DC area and I am now trying to capture it with my photography. The sights here are astoundingly beautiful and awe inspiring. Here is my perspective on our nation's capital. 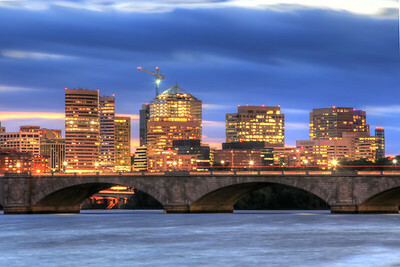 Rosslyn, Virginia from across the river in West Potomac Park. 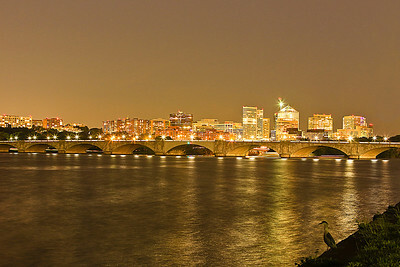 View of Memorial Bridge and Rosslyn, Virginia at night. I did not notice the bird in the lower portion of the picture until I looked at the camera. It was pretty dark and this was a 13 second exposure at ISO 1600. 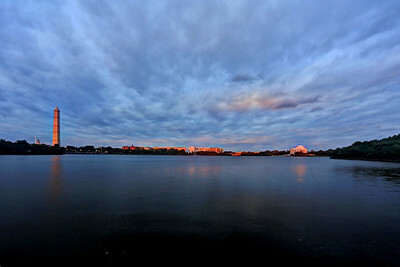 The tidal basin on Memorial Day weekend 2013. 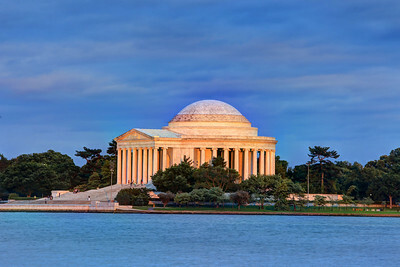 The Washington Monument has scaffolding up for repairs from the earthquake of 2011. 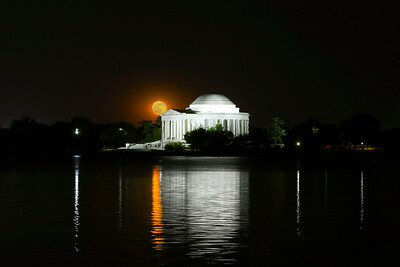 The full moon rising over the Thomas Jefferson Memorial on Memorial Day weekend. 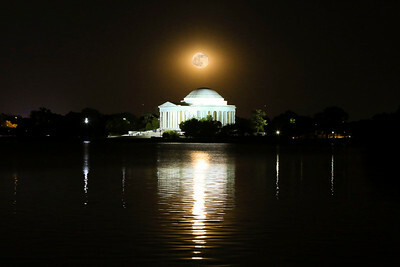 Full moon rises high over the Thomas Jefferson Memorial on the Tidal Basin in Washington D.C. on Memorial Day weekend. 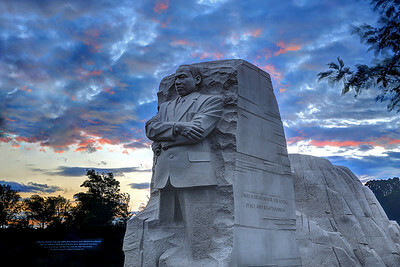 Here's a sunset image of the Martin Luther King Memorial. 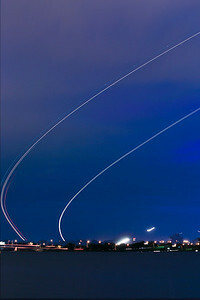 Interesting arcs in the sky from planes taking off from Reagan National Airport. These are multiple images with each image about 30 second exposure. 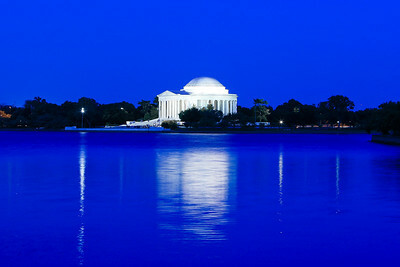 The blue hour is the twilight period just after sunset and before it is truly dark. 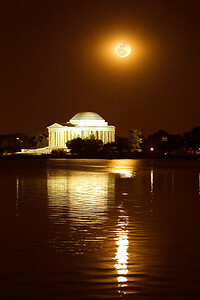 This image was captured about 25 minutes after sunset and before the moon rose. Though blue is a cold color, I really like the contrast of the monument illumination reflected on the water and the light bathing the steps that beckons into the memorial. 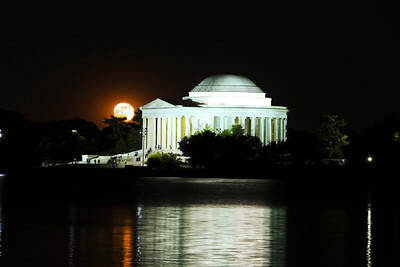 The rising moon seems to balance on the roof's edge of the Jefferson Memorial. 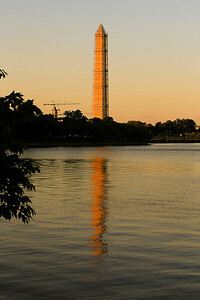 The Washington Monument is just now getting repaired from damage caused during the 5.8 earthquake of 2011. It costs $9.6M for the repair contract that includes the scaffolding work. The work consists mostly of sealing mortar cracks in the stonework.